A l’Oeil entre Deux Tours , Vos Feuilles sont Lignes Claires . Thank you. I love winter, too – but I know what you mean about autumn, it really is a gorgeous season! I’m running out of adjectives to describe your work Karen, I may have to resort to the thesaurus but for now I’ll say what I’ve said many times, simply beautiful. The colours are gorgeous and the tension created by the drop of water, hanging there, suspended in time, makes this image particularly, very special indeed. Thanks so much, Adrian, that’s very kind. We seem to have been of the cusp of freezing for several days, lots of interesting water droplets, some partially frozen. Wonderful frosted beauty Karen, and that water drop is amazing! All wonderful, but the patterns in that marvelous drip…fantastic. Thanks, Elena, that drip is just partially freezing up so it had some interesting patterns. The wonderful drop of water might be frozen..? Still life, elegant. Ok, just picked my jaw from off the floor! Stunning! And that droplet, there seems to be a whole biosystem in there… it looks alive, it looks complete onto itself like it has everything it needs to be what it is. So beautiful it hurts. Incredible photography, power in your eye for perfection. Hi Mary, thanks very much! M’encanta, semblen instants que es congelen i queden al marge del pas del temps. I like the title for these. And they themselves are stunning. I especially like the colours in the first one, Karen. Thank you, Ashley! I’m partial to those grey-green tones myself. Just what I needed at this point – serene and contemplative. Thank you. so simple, so serene…a nice still moment, amongst running around during the holidays…Beautiful. Excellent job! Your photography is just amazing, thanks. You capture such amazing shots..love the sprinkle of snow on the first two…so different from today with the uber snow to welcome in winter. Edges outlined by the pristine work of mother nature, seamstress of distinction. 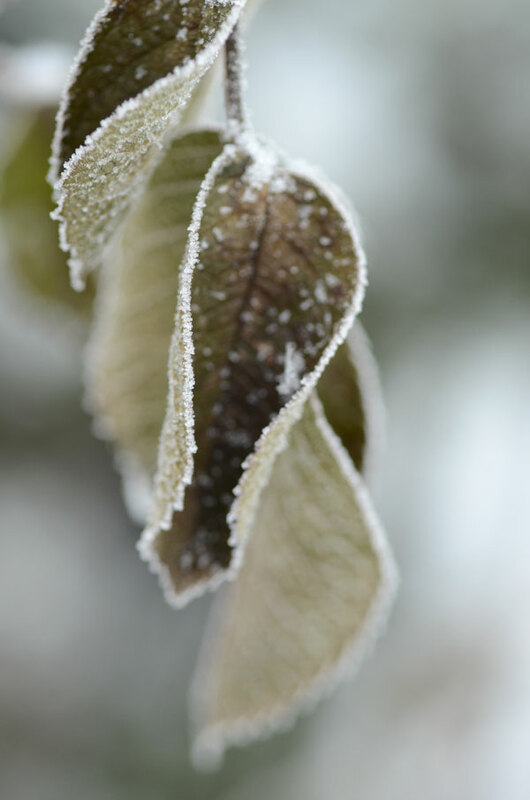 Like the worldliness of these – the shift in emphasis (from your recent posts) is very interesting – as the weather becomes more crystalline and delicate, so the plants become more robust. Beautiful shots. Your camera boldly goes into weather so cold that some people would fear to tread. And the world is all the better for it, Karen. Lovely. I came to your blog because it was recommended and I’m so glad I did! Your photography is wonderful! 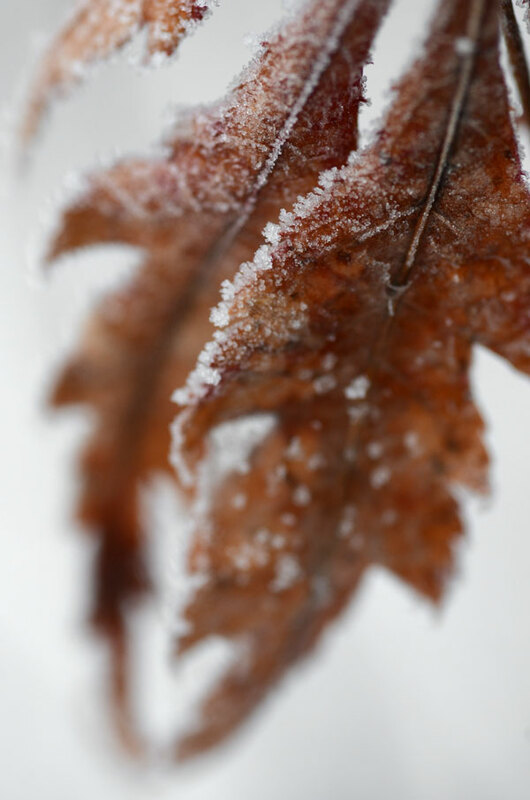 I have loved taking pictures of frost this early winter. None have turned out like yours! 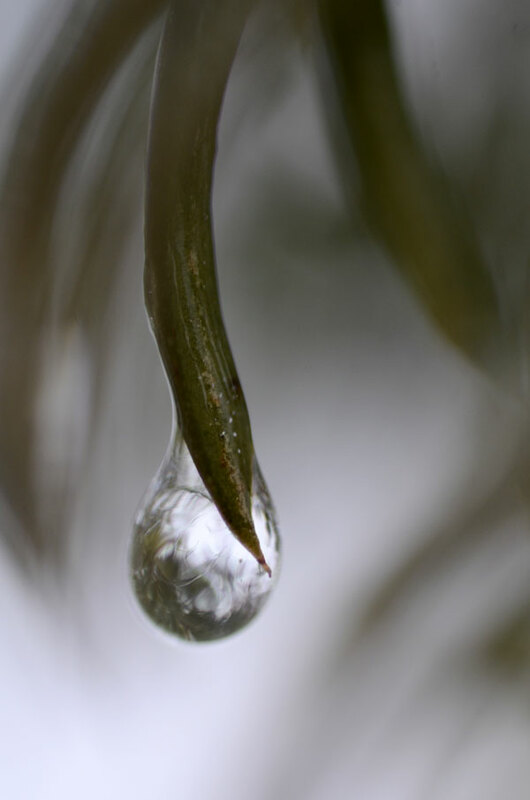 I also took a picture of drop of rain … again, nothing like yours! I’ve attached a link to the shot … suggestions?? Karen, unreal photos…. as always! Love the water droplet image, Karen. It makes me think I’m looking upon a whole new world when I gaze into these little watery spheres. Love these images. Nature at her simplest and beautifully captured.